Come join us for the annual Burn the Turkey group ride and potluck. Meet at Bur-Mill Park on Friday, November 23 @ 9:30AM. Shelter # 1 is reserved for the event (across the parking lot from the pool). This event is free and open to everyone. We will have multiple riding groups for each skill level. Everyone will regroup after the ride at the shelter for a potluck social. PFTS volunteers have spent 77 hours to clear Country Park & Wild Turkey of Storm damage. We have estimated 200 hours of work to clear the rest of the biking trails. We are coordinating with Parks & Rec. along with additional City staff to clear the trails. We have 6 sawyers and will be working all day long on Wednesday-Friday. We need your help to assist in dragging the cut debris off the trail. If you can help on any of these day’s please send an email to treedown@piedmontfattireoriginal.ellingtonmarketing.com. In the subject line please post “Can Volunteer”. 2. What day(s) and time(s) you can help. 4. Name and number of a person who we would be contacting in case of an emergency. Please come out for this important workday for the new Rich Fork trail! BUILDING SWEET NEW SINGLE TRACK. WE HAVE A LOT OF TRAIL ROUGHED IN AND NEED A LOT OF VOLUNTEERS TO HELP DO FINISHING WORK. BRING A FRIEND! PLEASE RSVP WITH EVITE TO QUALIFY FOR FUTURE $100 LBS PRIZE DRAWING. At the end of the street you will see a gravel driveway with a “No Trespassing” sign. (The Preserve is not yet open to the public, only for our workdays. ) Go in the drive and take the fork to the left. The parking area is at the top of the hill. All attendee’s will need to sign waiver before working. Will be provided for all registered participants. It is sponsored by Bicycle Toy & Hobby and University Kitchen. Work or hiking boots (sturdy shoes required). We’re hosting the annual JA King (and Queen) of the Watershed fundraiser/race in Greensboro on Saturday, September 29 2018. In order to pull off this fantastic mountain bike event, we need several volunteers to help with segment timing and work the aid stations throughout the day. Any time you can give is appreciated. This event is a big fundraiser for PFTS and can’t happen without volunteers from the mountain biking community. So if you’re not racing and can volunteer, please email us at volunteer@piedmontfattireoriginal.ellingtonmarketing.com. Thanks, and see you on the trails! It’s that time of year again! 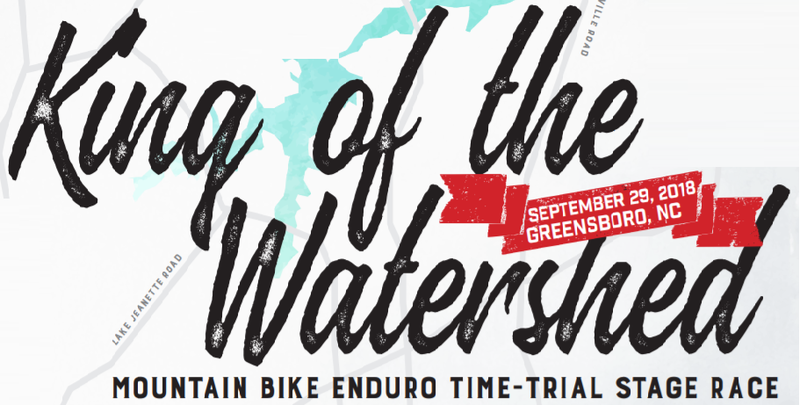 The 2018 King of the Watershed MTB Race is back and you don’t want to miss the biggest MTB event of the year! Who will take the crowns home this year? Come on out and volunteer, race, cheer on the competitors or just hang out with Mountain Bike folks. Remember, this event benefits the Piedmont Fat Tire Society so helping at the race helps everybody in the local Mountain Bike Community. We hope to see you there! It’s that time of year again! The 2018 Sizzler MTB Race, the Southern Classic MTB Series Finale is coming to Bur-Mil park Saturday July 14. Come on out and race, cheer on the competitors or just hang out with Mountain Bike folks. We hope to see you there! Be part of the next trail work day at Rich Fork! RSVP WITH EVENTBRITE to qualify for future $100 LBS prize drawing. The weather is looking good! We need a large turn out so we can complete as much trail as possible. Registration is important! It allows us to bring the tools we need and enough food for lunch! If you are planning on coming out and haven’t registered, please register now! If you are undecided but have some time, why not come out and help? If you’ve never come to a work day, don’t be shy, it’s a good time, a worthy cause and you’ll probably make some new friends. What: Building sweet new single track. We have a lot of trail roughed in and need many volunteers to help do the finishing. Bring a friend, or three! Can’t make it in the morning? Come out any time during the day to help. At the end of the street you will see a gravel driveway with a “No Trespassing” sign. (The Preserve is not yet open to the public, only for our workdays. Go in the drive and take the fork to the left. The parking area is at the top of the hill. Lunch, sponsored by Bicycle Toy & Hobby and University Kitchen, will be provided for all registered participants. What tools do I need to bring? You can bring loppers, garden or leaf rake, rogue hoe, or long handled shovel if you have one. We will also have tools available for all registered volunteers. I can only stay two hours is that okay? I can’t make this workday are there any weekday opportunities to help? Yes! Send an email to advocacy@piedmontfattireoriginal.ellingtonmarketing.com if you can participate in helping week days. Come hang out with Fat Tire folk. Nice, fun way to wind down the week. WHAT: BUILDING SWEET NEW SINGLE TRACK. WE HAVE A LOT OF TRAIL ROUGHED IN AND NEED A LOT OF VOLUNTEERS TO HELP DO FINISHING WORK. BRING A FRIEND! When: Workday starts at 8:30 AM. Can’t make it in the morning come out any time during the day to help. Lunch: Will be provided for all registered participants. Like to ride bikes? Let’s talk about it! Come hang out and meet some new riding buddies, as well as the folks who design, build and maintain your MTB trails. …who knows, you might even get to meet “The Architect” in real life! The Banff Mountain Film Festival World Tour is coming to High Point on Sunday, March 25th and Durham on Monday, March 26th! Two nights. Two unique programs. Proceeds to benefit three local nonprofit organizations. The Banff Mountain Film Festival, a program of Banff Centre, is the largest, and one of the most prestigious, mountain festivals in the world. Hot on the heels of the festival held every fall in Banff, Canada, the Banff Mountain Film Festival World Tour hits the road. Traveling to exotic landscapes and remote cultures, and bringing audiences up-close and personal with adrenaline-packed action sports, the 2017/2018 World Tour is an exhilarating and provocative exploration of the mountain world. From approximately 400 films entered into the annual festival, award-winning films and audience favorites are among the films chosen to travel the globe. The High Point showing will feature films such as The Last Honey Hunter. The Durham showing will feature Loved by All: Apa Sherpa and Into Twin Galaxies. Proceeds from these two showings will benefit three local nonprofit organizations: Piedmont Fat Tire Society; the local chapter of the National Interscholastic Cycling Association (NICA); and Triangle Land Conservancy. For tickets and information contact The High Point Theatre box office (336.887.3001 | 220 E Commerce Ave, High Point, NC 27260) and/or the Carolina Theatre of Durham box office (919. 560.3030 | 309 West Morgan Street, Durham, NC 27701). Tickets for the High Point show are also available for purchase at the Greensboro REI. The final master plan, which can be seen on the Master Plan page, has been approved by the park advisory committee and will be presented to the County Commissioners for their approval on Monday, March 19, 2018. This is a public meeting and the community is urged to attend in order voice support or concerns for the plan. The meeting will begin at 6:30pm and be held at the Governmental Center in Wentworth. THIS WORKDAY HAS BEEN CANCELED DUE TO WEATHER. WE WILL POST THE NEW DATE AS SOON AS IT IS RESCHEDULED. Please come out for the next workday for the NEW Rich Fork trail! All attendee’s will need to sign waiver before working and to qualify for future prize drawing. What: Building sweet, new singletrack! We have a lot of trail roughed in and need a lot of volunteers to help with the finishing work. Bring a friend! Workday starts at 8:30 AM. Can’t make it in the morning? Come out any time during the day to help. Lunch: Will be provided for all registered participants. Register now! When is the next work day? To Be Announced for April either 14th or 21st. There are multiple workday opportunities during the week. Send an email to advocacy@piedmontfattireoriginal.ellingtonmarketing.com if you can participate in helping week days! We’ll let you know as soon as it’s scheduled. I can’t make this workday, when is the next day scheduled? Come join us for the Piedmont Fat Tire Society Annual Member Meeting! The meeting will be held at the Loft above the W on Elm in downtown Greensboro. Doors open at 6:00 and the meeting will go from 7:00pm until approximately 9:00pm. Refreshments are available in the Loft area and food can be purchased from the restaurant downstairs. We will be discussing the previous year’s accomplishments, plans for the coming year, and of course awarding one or two Golden Gnomes! There will be great socializing and raffle prizes so be sure to come out and bring a friend. Alright Fat Tire family. Thanks to the generosity and partnership with our wonderful local bike shops, we are giving away one $100 and two $50 gift cards at our annual meeting. You need to be a current member by 2/4/2018. There is considerably more to give away, this is a portion that only PFTS members qualify for. JOIN NOW, there is still time! As always the best way to show your support for mountain biking in the Piedmont is to become a member! So please join today!